Before purchasing a diamond we believe you deserve a transparent education. This will allow you to ask the right questions and make an educated and thoughtful purchasing decision. Diamond education goes beyond the 4 C’s and any trustworthy jeweler should provide you the knowledge you deserve before even showing you diamonds. The Diamond Reserve carefully purchases our GIA certified diamond inventory, going through rounds of inspections and viewing thousands of diamonds to provide stunning options not just based on grading specifications, but visual brilliance and beauty as well. As a private jeweler it is our job to find you the perfect diamond not just based off our inventory, but by leveraging our close relationships with diamond sources. We will bring you the right options and allow you to view multiple diamonds that fit your needs. We never recommend picking the first diamond you see; you need options to compare and contrast. Beyond the 4’C’s of diamond grading it is important to understand what certificate should accompany your diamond and what is the fluorescence grade. Both of these factors significantly impact the quality and the value of your diamond. Diamond grading laboratories were created to provide consumers with a certification that accompanies the diamond to ensure through an independent third party the diamond quality. This certification allows consumers to make a knowledgeable purchase and removes the doubt between the consumer and jeweler. What is very important to understand is that just because a diamond comes with a certificate does not mean it is reputable. 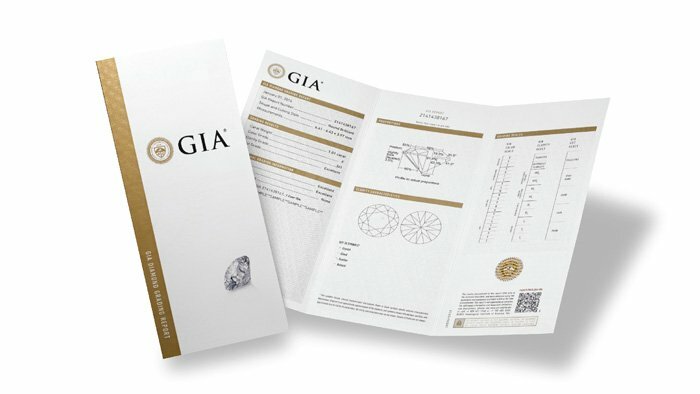 The Diamond Reserve will only sell GIA certified diamonds. The Gemological Institute of America is the only non-profit grading laboratory with a mission to protect the consumer. 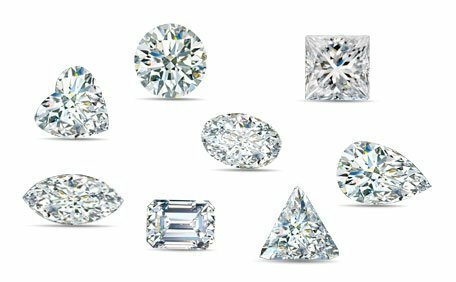 The GIA grades diamonds very strictly, using multiple gemologists to examine the diamond with cutting edge technology to determine the diamond’s quality grading. There are many other grading laboratories, but we believe it is in the consumers best interest to only purchase GIA certified to protect their purchase as many of these labs are not reputable or respected. We never recommend purchasing an uncertified or diamond that is graded by the seller. If considering purchasing a diamond graded by another laboratory then do your research, get educated, and do not make a pressured purchase. We’ve hand-picked the video below as an excellent resource to help explain the grading system. "... the visible light some diamonds emit when they are exposed to invisible ultraviolet (UV) rays. On a GIA diamond grading report, fluorescence refers to the strength, or intensity, of the diamond’s reaction to long-wave UV, which is an essential component of daylight. The light emitted lasts as long as the diamond is exposed to the ultraviolet source. " We only sell diamonds with a fluorescence grading of “None” or “Faint”, having no impact on the quality, aesthetic, or value of the diamond. When diamonds have a fluorescence grade outside of none to faint it creates a milky cloud within the diamond, causing it to lose luster. 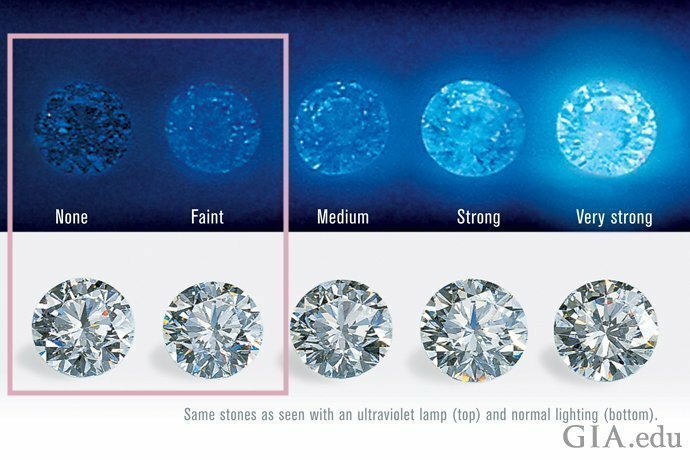 Some jewelers will tell you that if you buy a diamond with a low color grade and a “Medium” or “Strong” fluorescence grade it will make the diamond look whiter. It is important to understand you are NOT looking for a white diamond, you are looking for a colorless diamond that refracts light well. It is very important to always know what the fluorescence grade of the diamond you are viewing is. Many jewelers make a lot of money selling diamonds with fluorescence grades outside of the none to faint range when the consumer does not know about this quality factor and the effect it plays on pricing and quality. Diamonds can be cut in all different shapes. A diamond’s shape is often confused with the cut grade of a diamond, though they are not the same. The diamond shape refers to the general silhouette of the diamond. The round diamond has continuously proven to be the most timeless and popular shape, therefore being the most expensive. When choosing the shape it is important to consider the popularity of the shape at the time as well as throughout history. Certain shapes maintain higher value due to their timelessness. Diamonds are measured in size by carats, not to be confused with karats (unit of measure used to describe how much pure gold there is in an alloy.) 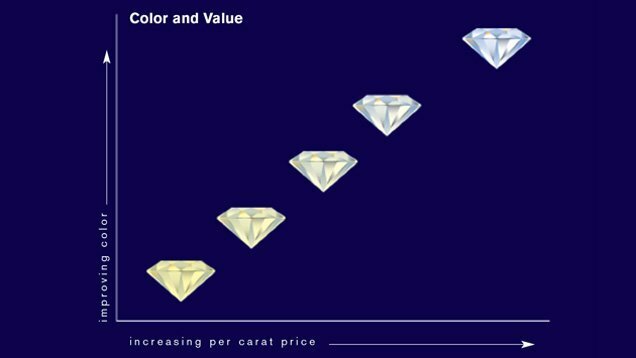 There are 100 points in 1 carat, which is important for understanding how pricing works. For every 50 point increase you see, there will be a major leap in pricing. A 1.50 carat diamond will be priced significantly higher than a 1 carat diamond of equal grade. This is because larger diamonds are more rare and only one and every thousand diamonds is above 1 carat in size. For example, if you’re looking for a 1 carat diamond, we often recommend viewing a .90 carat to see the price and size difference. Diamond color refers to the absence of color. The less color in a diamond, the more valuable it is. The highest color grading is D, which signifies a colorless diamond, similar to a drop of pure water. When a diamond has a lower color grade it will have hues that are yellow or brown in color. The GIA color grading scale starts at D and goes all the way to Z. The Diamond Reserve will only sell engagement diamonds with a grading range from D to J. Color grades D, E, and F are colorless, and G, H, I, and J are near colorless. GIA Resident Masterstone Series 5A. Left to right: E, F, H-I, J-K, K-L, Z. Round shaped diamonds carry color very well; one may buy a J color to capitalize on carat weight, while others may value color over carat weight. Some fancy shapes do not carry color as well due to having a shallower cut such as the oval, so we only recommend purchasing an H color and up when purchasing an oval shape. Viewing diamonds over a white surface in a white well naturally lit room will allow you to understand and differentiate color grades, be aware of very dark rooms and LED lighting when choosing your diamond. Be sure to work with a jeweler who will show you an array of diamonds with different colors, allowing you to determine the color grade that best fits your needs and budget. Diamond clarity is the measurement of the internal inclusion and external blemishes a diamond has, referring to where the crystal structure did not form perfectly. The clarity grading is determined by the amount of inclusions, where inclusions are located, the type of inclusion in the diamond, and how the inclusions affect the overall appearance of the diamond. Most diamonds have inclusions, but what is important is where they are located in the diamond and that they are not visible with the naked eye. The GIA clarity grading chart starts at “Flawless,” which means the diamond has virtually no imperfections, and goes to “Included,” meaning the diamond has inclusions that are visible with the naked human eye. The GIA says that anywhere from “Very Very Slightly Included/ VVS” to “Slightly Included/ SI” will have inclusions, but that they are not apparent to the naked eye. We do not sell diamonds with a clarity grading of “Included,” as most of the retail stores do. We believe once the inclusion has been seen it will become the focal point of the engagement ring. When one looks into their diamond they should see the sparkle of an endless love story. When choosing the clarity grade and purchasing in the “Slightly Included/ SI” range it is important to work with a jeweler you trust. If the inclusion is dead-center then there may be certain angles and lightings where the inclusion in visible (refer to * and ** in image). We carefully examine our diamonds to ensure that no inclusions are visible to the naked eye and are in the best possible locations. 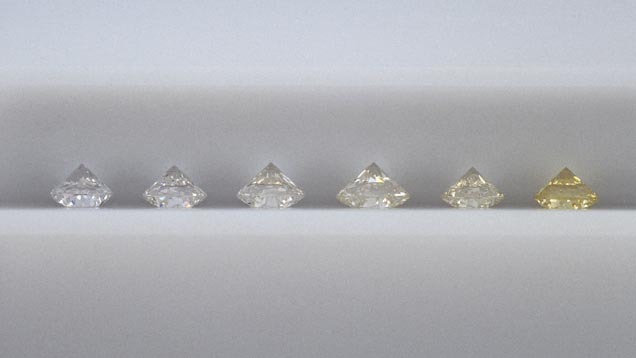 Just because two diamonds have an equal clarity grading does not mean they are visually equal as one may have the inclusion in the center and the other may have it off on the side. Do consider that the diamond with it off to side may be slightly more expensive as it will have an overall better value. When viewing diamonds it is important that the jeweler you are working with allows you to see the diamond under magnification and has you locate the inclusions, once you have seen them under magnification and know where they are then take a look with the naked eye and make sure you cannot see the inclusions. NEVER buy a diamond without viewing it under magnification. Make sure you understand where the inclusions are located and be careful of trickly LED lighting that makes looking into the diamond hard. Be sure to examine in every day indoor natural lighting. The cut of the diamond is one of the most overlooked characteristics by the consumer when purchasing a diamond, but it is incredibly important. Cut is all about the sparkle; the reason why diamonds are so loved! Cut refers to the overall make of diamond and how man brought the diamond’s luster to life from the rough. Cut is the proportion and arrangement of the diamond’s facets and the overall workmanship, which determines the amount of brilliance, fire and sparkle a diamond has. The Diamond Reserve only sells diamonds that have a cut, polish or symmetry grading of “Excellent,” or “Very Good.” A diamond with the most sparkle will have only “Excellent” cut, polish and symmetry grading. For rounds diamonds this is referred as “Triple X”. When purchasing outside of “Excellent” or “Very Good” your diamond could be too deep or too shallow, affecting how it sparkles. A shallow diamond will not emit light well and will have black, dead spots where there is no sparkle. A deep diamond can face up small, meaning that because it is carrying so much depth, it does not face up true to it’s carat weight. For example, a deep, 1 carat diamond may face up as small as a .70 carat diamond, drastically affecting the value. 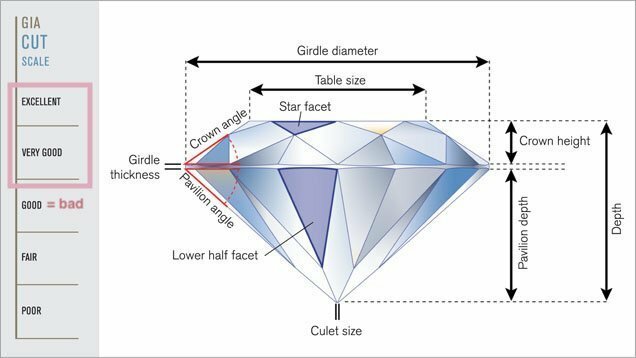 Many jewelers and retailers use terms such as “Ideal Cut,” and “Super Ideal Cut,” these are NOT terms used by the GIA or on the certificate, it is important to never overlook for a round diamond; cut, polish and symmetry grades, and for a fancy shaped diamond; polish and symmetry. Be sure to view the diamond in different types of light such as sunlight, led lighting, and natural indoor everyday lighting to make sure it has the sparkle you love that catches your eye just right.